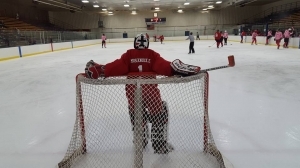 This is my 6th year with the MGHA, but I have been playing hockey since I was a child. A transplant from Northern MN, I am a UW Madison Alum and moved back to the city in 2012. I enjoy the MGHA because of the different people I get to meet and help instruct in the ways of the game. I try to stay active within the league by helping out with fundraisers such as the Blades Against AIDs and MGHA Turn About Drag Show. Always look forward to each Sunday night during the winters and seeing all the team progress in this wonderful sport! !